Carolina Heritage Outfitters was founded in 1989 and is the oldest and most respected outfitter on the Edisto River Trail. 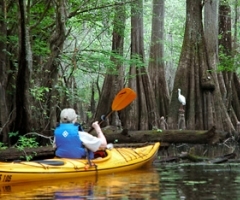 Shortly after its founding, it established the 150-acre private Edisto River Refuge with over a mile of river front on the longest, undammed blackwater river in the country. 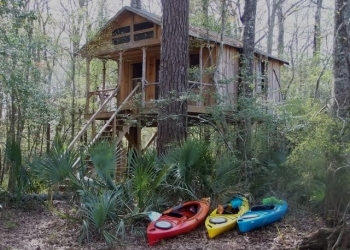 Whether floating down the Edisto on the way to your secluded site, walking on miles of trails, or relaxing on the deck of your private treehouse, you will enjoy being immersed in this fragile ecosystem. Great blue heron, egrets, wood storks, pileated woodpeckers, wood ducks, wild turkey, and deer are often seen on the refuge. Frogs and owls serenade nightly. Private river access for the treehouses allow you to come and go as you wish. Fully furnished, each sleeps from 2 to 8. Each of the 3 treehouses is tucked in the woods out of view of any other, nestled in the trees on the river's edge and has its own fire pit. 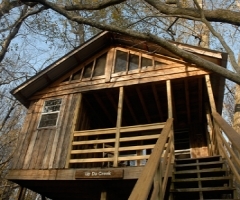 Rental of a treehouse includes the use of a canoe and a shuttle to the put-in. Paddle in on Day 1, spend your night or nights in the treehouse and then paddle out on your last day. Unparalleled privacy and natural beauty. 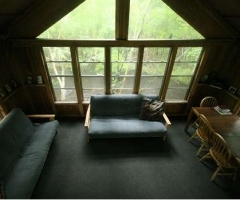 Cost includes canoe, shuttle service, secure parking and treehouse: $150/person on a Saturday night, $75 for a second night; $125/person any Sunday through Friday, $75 for a second night. Many guests return year after year.